Excel 2016 includes a powerful new set of features based on the Power Query technology, which provides fast, easy data gathering and shaping capabilities and can be accessed through the Get & Transform section on the Data ribbon. Today, we are pleased to announce two new data transformation and connectivity features that have been requested by many customers. Enhanced Web connector—support for specifying a Command Timeout via the UX. Enhanced CSV/Text connector—support for Fixed-Width delimited files. 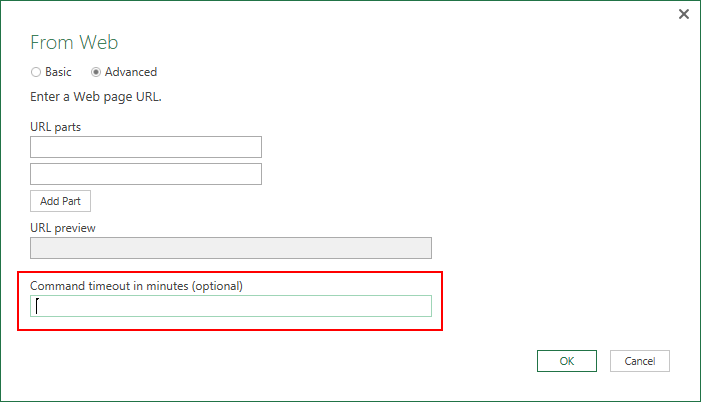 In this release, we enhanced the Web connector to allow users to specify a Command Timeout value from the connector UX dialog. Before this release, this could only be achieved by customizing the underlying M query.